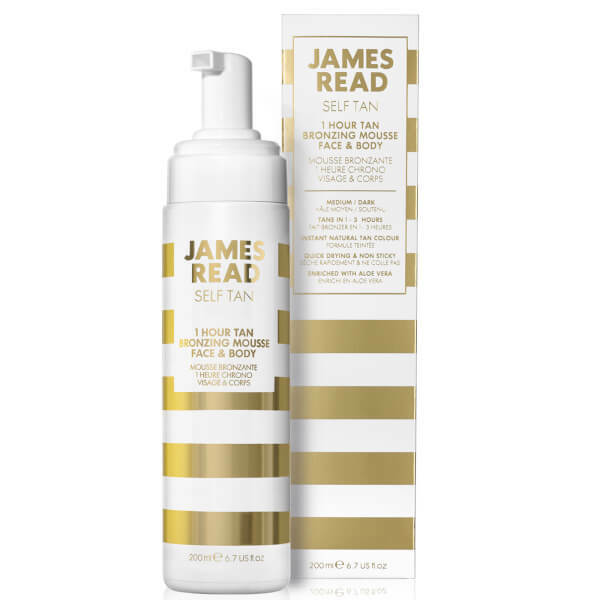 Achieve a natural-looking golden glow in as little as an hour with the 1 Hour Tan Bronzing Mousse for Face and Body from James Read; an easy-to-apply express bronzing formula that delivers an even and streak-free tan within 1-3 hours. Enriched with the hydrating benefit of Aloe Vera and antioxidant Green Tea Extract, the lightweight, aerated mousse leaves skin radiant, supple and silky smooth. 1. Using a dry Tanning Mitt, apply to the body in sections using circular motions, starting at the ankles and working your way up. 2. Ensure the tan has been applied all over using the product's tint as a guide. Leave feet and hands until last using what remains on the mitt. 3. Wait for 1 hour for a light tan, 2 hours for a medium tan or 3 hours for a deeper tan. 4. Avoid contact with water for 1-3 hours and then rinse. Aqua/Water/Eau, Dihydroxyacetone, Propylene Glycol, Glycerin, Ethoxydiglycol, Aloe Barbadensis (Aloe Vera) Leaf Juice, Sodium C14-16 Olefin Sulfonate, Phenoxyethanol, Sodium Benzoate, Erythrulose, Tocopherol (Vit E), Retinyl Palmitate (Vit A), Ubiquinone (CQ10), Camellia Sinensis (Green Tea) Leaf Extract, CI 16035 [Red 40], CI 19140 [Yellow 5], CI 42090 [Blue 1].